The Club Mermaid Village is a large modern holiday complex with hotel guest rooms and apartments set in landscaped gardens with lawn and lush plantings. The paved pathways wind between the main building and the apartments and the vast array of facilities on offer. Club Mermaid is 600 metres from the beach and 16 km from the bustling town of Alanya. This is a great choice of resort for a fantastic, and affordable, fun filled family holiday in a warm and hospitable environment. Getting to the hotel: The resort is 110 km from Antalya Airport - an easy and comfortable trip if you use our Transfers4u.com service. The All Inclusive Club Mermaid Village offers fantastic facilities for all ages and interests - something for everyone and no time to get bored! Food, drink and entertainment: One indoor restaurant which is air-conditioned and one outdoor restaurant for 350 people. There is restaurant bar, pool bar, disco bar, anfi bar and beach bar, an internet cafe, cinema/conference room, daily animation (01.05 – 31.10), and activities and night shows (6 x a week). 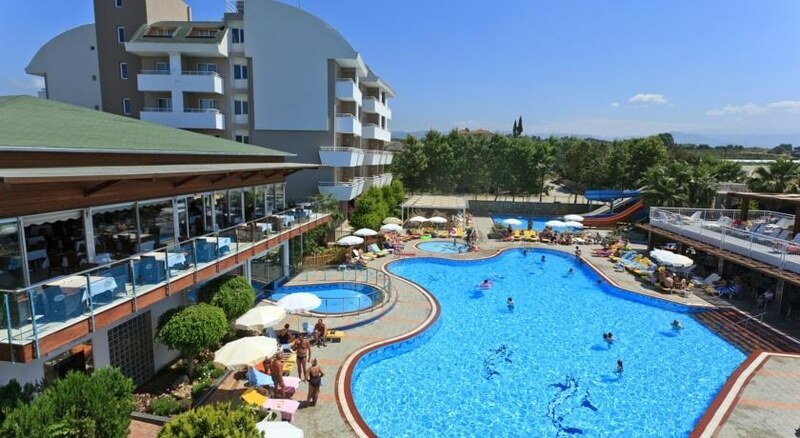 Sport, games and activities: 2 outdoor swimming pools (400 m² – 200 m²) and one with 3 water slides, one indoor swimming pool, Turkish bath, sauna, massage, table tennis, volleyball, darts, billiards, and a Fitness Centre. 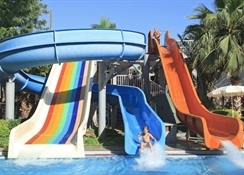 For the kids: 3 swimming pools for children, Kids Club (4 - 12yrs, open from 10am till 12pm and 2.30 till 5pm), playground, mini golf, and a disco. Additonal: Mini market, hairdresser, souvenir shop, clothing shop, jewellery shop, laundry service, safe, money change, rent a car, post service, doctor, free bus service to Konakli, Avsallar and Alanya (at least 5 times a week) and free bus service to the beach. The Village has 42 apartments with 2 rooms and 3 rooms - all the bedrooms are air-conditioned (some apartments the living room air-conditioning is extra), and all apartments contain a minibar, TV, telephone, hair dryer, a bathroom with bathtub or shower and a balcony. In the Hotel there are 162 guest rooms containing 1 double and 1 single bed. All the rooms are air-conditioned and all rooms have a mini fridge, TV, telephone, a hair dryer, a bathroom with bathtub or shower and a balcony.